Dinosaur Land was a bit different than the Mushroom Kingdom we knew and loved, but it still had that same Mario charm to it. Chocolate Island was no exception. The first normal stage on the island itself is the most interesting one in the game. Depending on how many coins you collect in the first part of Chocolate Island 2, you’re brought to one of three areas. Then, depending on how much time is left on the timer when you leave that section, you’re brought to one of three areas again, one of which has a secret exit. Finally, depending on how many Yoshi Coins you’ve collected along the way, you’re brought to one of two possible final areas. If you were like me and hell-bent on finding every exit in the game, you had to figure out how this stage worked. Luckily I had my copy of Mario Mania, so I was all set. Everything in this world looks like it’s been coated with a nice layer of chocolate. The map looked like some kind of chocolate chip cookie cake with castles and level markers on it, and even the inside of the castles themselves were built with giant chocolate blocks. I used to look at the “lava” in those castles as just being ash-colored lava, but it makes more sense to look at it as though it was hot cocoa! 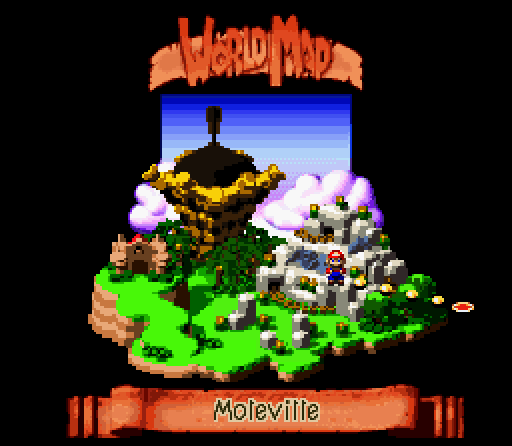 The rest of Super Mario World is fun too, but Chocolate Island is the level I look forward to the most, if only because it actually makes me want to dive into a stash of chocolate bars. Believe it or not, there was a time when a “throwback” in gaming was a pretty novel concept. Taking a stroll down memory lane from time to time was a fun way of switching things up, before developers started doing remakes of pretty much every game we grew up loving. Not that I’m complaining, but, y’know, a little bit of innovation and originality never truly hurt anyone. 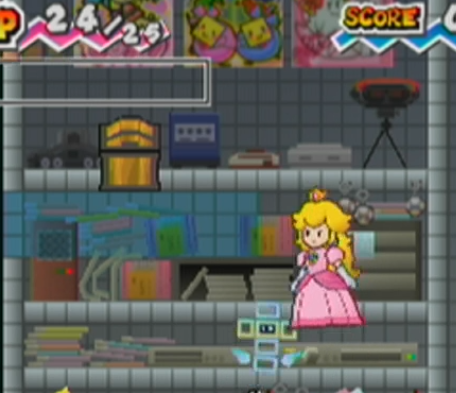 I played Super Paper Mario in the first year I was in a relationship with Nita. We had only been living together two months when this came out, and it was the first game her and I played through “together” – or rather, I played, and she watched and helped me solve most of the puzzles. 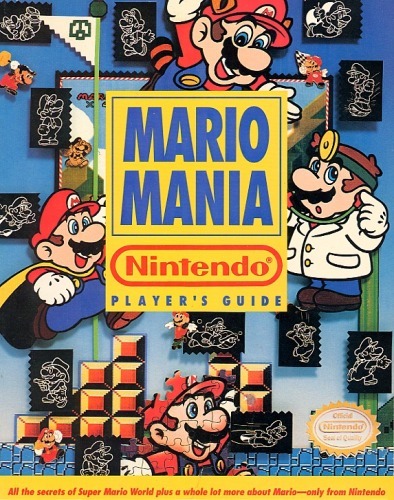 The 2D-to-3D aspect of the gameplay was pretty fun and there are lots of references to Mario’s past, but the game’s third chapter goes all out as Mario travels to an area called The Bitlands. The first thing you’ll notice is that there’s an obvious pixel theme going on. 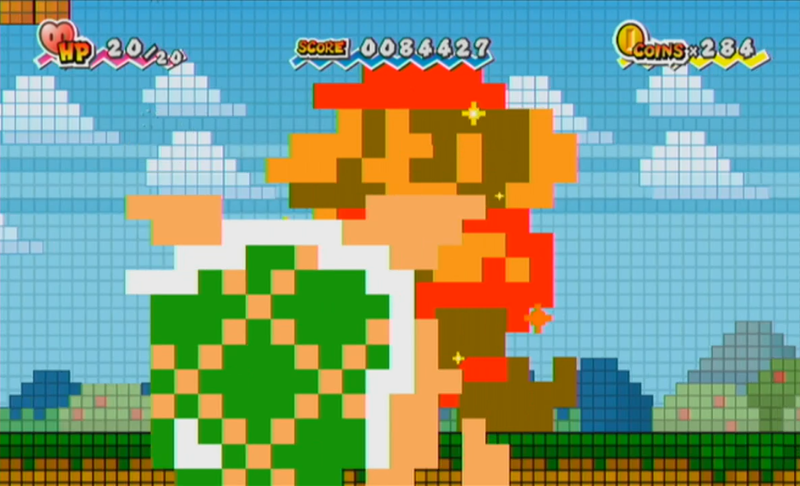 Not long after the first stage starts, there’s a stretch where you get a Mega Mushroom, which turns you into a giant 8-bit version of your character. Immediately after you shrink back down to size, a Koopa Troopa gets a a hold of one and chases you down, only for you get one again to turn the tables on him! It was wild, and so much fun! 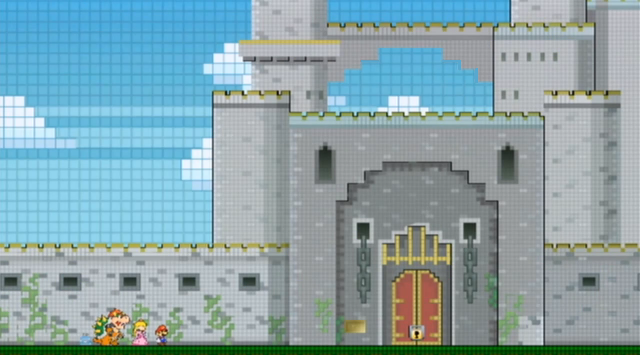 It also pays homage Stage 1-2 from the original Super Mario Bros. – there had been a few nods to 1-1 in other games at this point, so giving 1-2 some love was great to see. Anyway, the level also introduces a character named Francis, a geeky chameleon who shares our love of all things retro. Check out his console collection!! He even has all the portable consoles on display in another room. Impressive! He even likes the Virtual Boy enough to own it. All in all, I look back fondly on The Bitlands because it was an early taste of retro before just about everyone started doing it. Continuing with the food theme, I absolutely love lemon meringue pie. It’s like Nintendo called this world Meringue Clouds just for me. Even though it’s just a name and the world isn’t actually made of meringue, just seeing that word on the map screen, just… *sigh* it makes me want lemon meringue pie, SO BAD. Even the map markers look like candy, which makes it all the more appetizing. I know, I know, it’s the same thing as with Chocolate Island making me want to dive into a stash of chocolate and it’s kinda weird, but hey – that’s just where my brain goes! 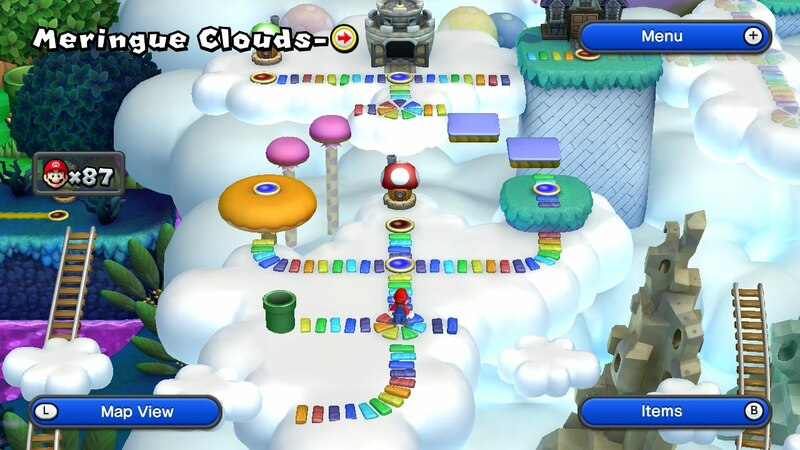 More importantly though, stages in Meringue Clouds are both fun and challenging in ways that actually make me wish the whole game was that difficult. Also, check out this great stage that has you running underneath the Airship instead of on it, all while dodging this giant mechanical hand throughout. So cool! Honestly, this was a nice surprise twist on the usual Airship stage. 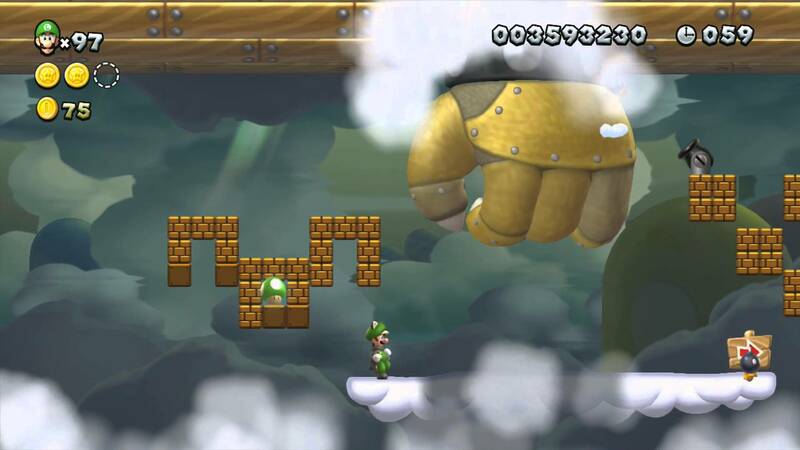 Ironically, New Super Mario Bros. U doesn’t bring much new to the table other than Squirrel Mario, but the game really does shine when it gets challenging like it does in Meringue Clouds – thankfully, New Super Luigi U came around and satisfied that itch for tougher Mario platforming. 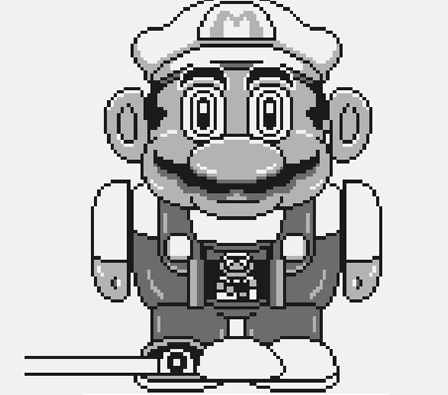 Super Mario Land 2 was a huge improvement over the first one and had worlds that could be tackled in any order. Mario climbed up the insides of a massive tree, dealt with zombies in a Halloween-themed pumpkin level, went into the low-G atmosphere of the Moon, and finally into the belly of a giant whale. 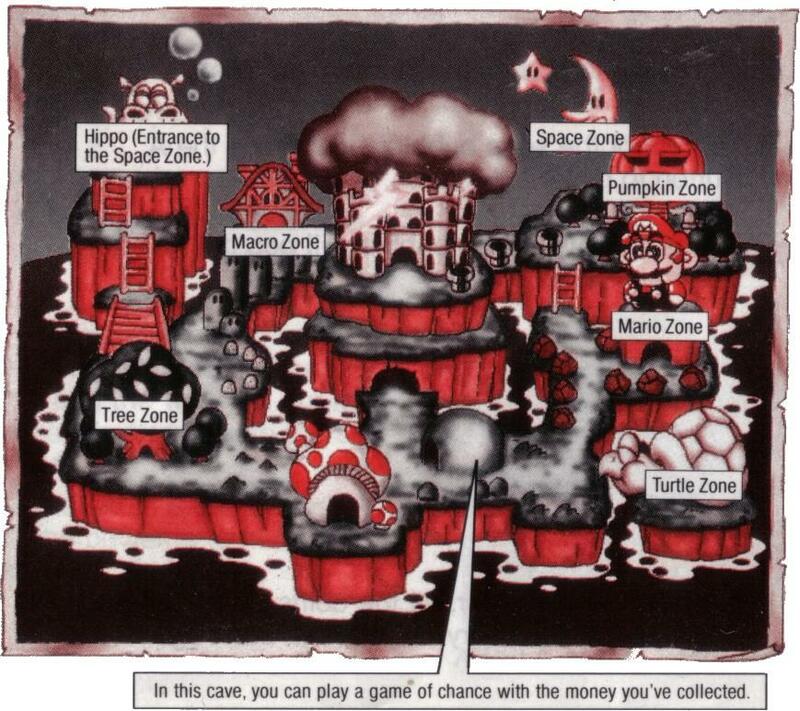 The best level, however, was one where Mario explored the inside of a giant robot version of himself; the Mario Zone. So many zones, so little time. The level’s first stage has you jumping through stationary and rotating gears, making it feel like you’re actually in the belly of a giant machine. 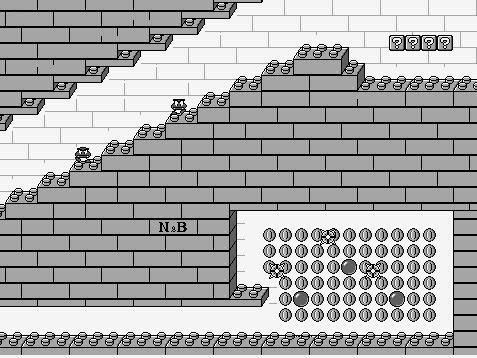 The second stage is built with a bunch of balls (which was maybe an attempt to look like blood cells), while the third stage has a bunch of chain-driven platforms, and even incorporates the mechanical arm from the end-stage mini games… it was all lots of fun, but the fourth stage is what I thought made the level so great. Leggo my Lego! Wait… that’s not it. 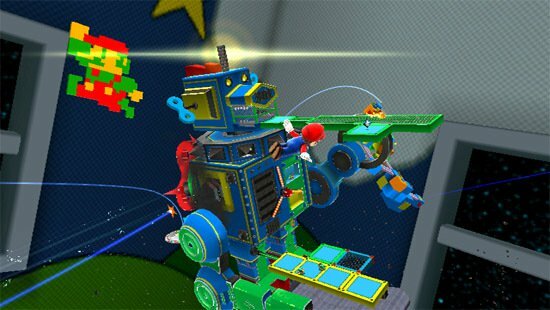 The idea that robot-Mario’s “brain” was made of Lego blocks was hilarious to me. I was at an age where I was playing with Lego quite often, so the stage resonated quite a bit with me at the time. Then there’s the “N&B” logo I always saw, but never paid much attention to. When I played through the game recently, I decided to Google it. 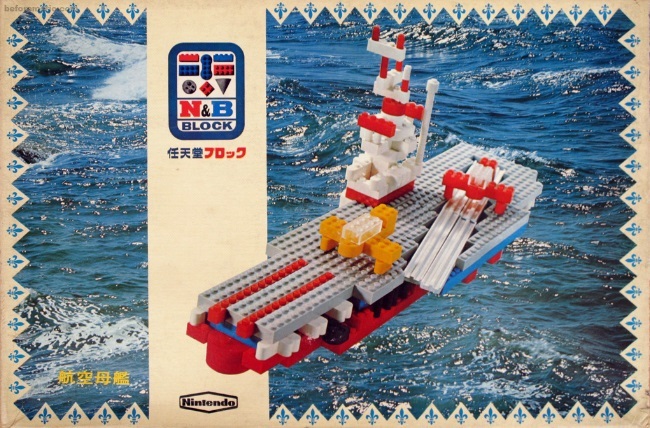 I had absolutely no idea about this, but Nintendo sold a line of toys back in the 60’s and 70’s called “N&B” blocks, which were pretty much Lego knock-offs. I already knew a little bit about the history of Nintendo; how they started out by selling Hanafuda cards in the 1800’s, the Ultra Hand (thanks to Wario Ware) and the Game and Watch, but I had no idea about these blocks. Once I started looking into them, I found out about all the other toys Nintendo sold before video games. They had a lot of stuff! Not quite as polished as actual Lego, but still cool. 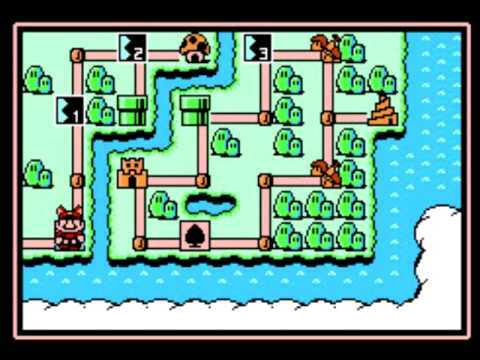 Super Mario Land 2: 6 Golden Coins was a great game that lots of people overlook when talking about the classics, but the Mario Zone is one of the main reasons I’ll never forget it. It was mostly due to the considerable graphic upgrade, but levels in Super Mario Bros. 2 felt quite different than those in the original. World 2’s desert stages were fun, and the rocky waterfalls in World 3 were cool, but it was World 4 that had me thinking this was the craziest game I had ever played. The way the physics worked when you were on the ice took a bit of getting used to, but I loved the way the level looked. It was snowy, but at the same time kinda tropical-looking… the rocks were green, the water down below wasn’t frozen, and there was vegetation at the end of the stage… hmmm. Dead end. Oh, what’s this plant hiding? Seeing the rocket take off for the first time had me in stitches from laughing so hard. It was so random! It was completely out of place, and I loved it. I didn’t understand at the time that the land being named “SubCon” suggested it was all just a dream, so I just assumed the rocket thing was Mario being random and silly (like Bugs Bunny, or something). 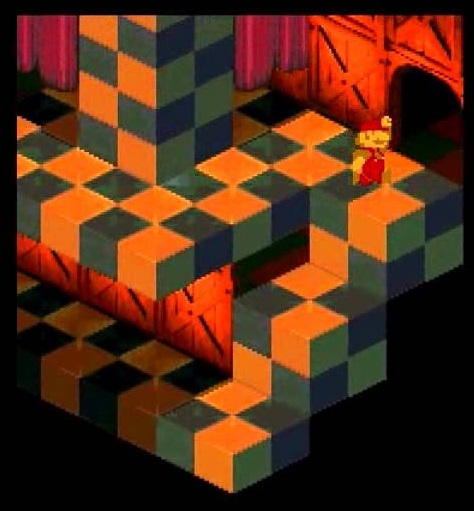 There was the constant stream of Beezos at the beginning of the second stage that would stress me out whenever I got to it (I ended up having the pattern memorized before too long), the moment of realization those “platforms” you were jumping on were whales, and finally, a helpful appearance from Birdo. Once you figured out his eggs were actually your ticket across the sea, a running jump over this gap as either Luigi or the Princess allowed you to skip a fairly annoying chunk of the level. This world took everything you thought you knew about the rules of a Mario game and flipped it on its head, and it was great. Both Galaxy games are absolute masterpieces – they’re imaginative and challenging in ways that make you wonder if they’ll ever run out of ideas for a Mario game. The Toy Time Galaxy from the first one is a prime example of this. The idea of Mario running and jumping through giant toys is one I couldn’t help but take satisfaction in. It doesn’t take place in space but what seems to be a child’s bedroom, which is interesting. The first star’s “boss” is a giant robot you have to scale and dismantle by removing the screws holding it together. After climbing the legs and removing a chest panel to go from one side to the other, you get to do some serious damage by removing a pretty important screw – the one holding the giant arm you’re standing on. As the arm falls away and you barely manage to get across to the other side, the only thing left is to get to the head and destroy the whole thing. Spring Mario is a bit awkward to control, but it’s so fun to topple such a big structure by taking it apart as opposed to attacking it directly. This sticks out as one of the most memorable parts of an already very memorable game. 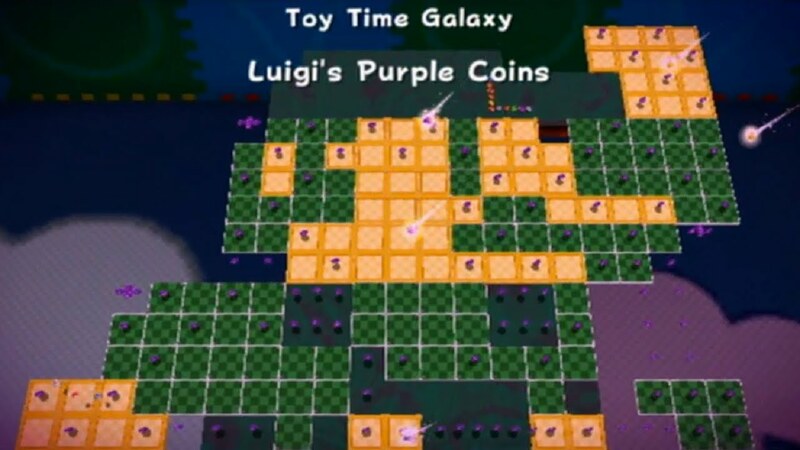 The galaxy is bright and colorful, has a stage made of desserts that reminds me of Bio Miracle Bokutte Upa’s second stage, and is home to the Luigi’s Purple Coins mission, which is essentially the end of the first “half” of the game. Technically not the right colors, but I’ll let it slide. It took me quite a while to beat that one on my first try, but once you manage to find a route that works, you should have it beaten in no time. It’s still an incredibly fun stage, and one of the main reasons I love the Toy Time Galaxy so much. I didn’t care for traditional turn-based RPG’s as a kid and in fact I still don’t, but Super Mario RPG was a special case – Mario was in it, so I had to at least give it a shot. It took me a little while to get used to managing battles and making the most of timed hits, but before too long, I got the hang of it. I still found it quite challenging and a bit stressful during certain boss battles, simply because I didn’t feel like I was in control of my own destiny and that luck had a lot to do with it. I persevered, and by the time I made it through Mole Mountain, I was hooked. The whole thing in the mine and searching for the kids was great, and that mine cart ride at the end was a fun way to wrap it up. Whenever I play the game now, I always look forward that part. After that, you take a trip to Booster Tower, and before too long, BOWSER becomes a member of your team! Mark that down as one of the crazier moments I had in playing video games as a kid… playing AS Bowser in a Mario game!! Crazy! The Tower itself is fun and full of little nooks and crannies to explore, and this throwback was pretty hilarious when I first saw it. “Eyyyy, I know that guy. Booster himself is the funniest\dumbest character in the game, and the crazy stuff leading up to his wedding with Princess Toadstool stands out as my favourite part of the game, by far. Finally, the last boss before moving on to the next area is a wedding cake that turns into a monster, and you have to defeat it by stomping out the candles on top… it truly isn’t as easy as it sounds, but it’s definitely a great feeling once you’ve beaten him and moved on. 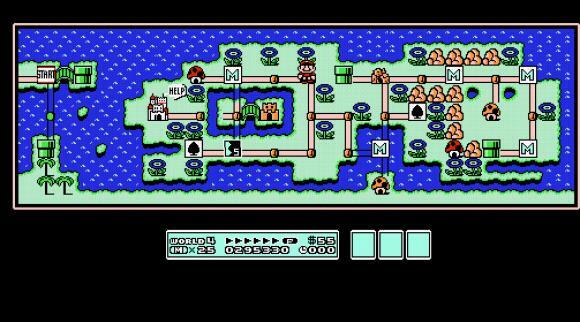 Super Mario Bros. 3. was the first game in the series where each world was completely fleshed out with an area map. This helped make the biggest game from our childhood feel even bigger, but the way Sky Land’s map was designed literally brought it to a whole other level. Ohhh. Sky Land. I get it now. …and into another part of the map you had no idea was there. There wasn’t even a boss battle at the end of it! The whole purpose of the castle was to just get you up into the clouds! 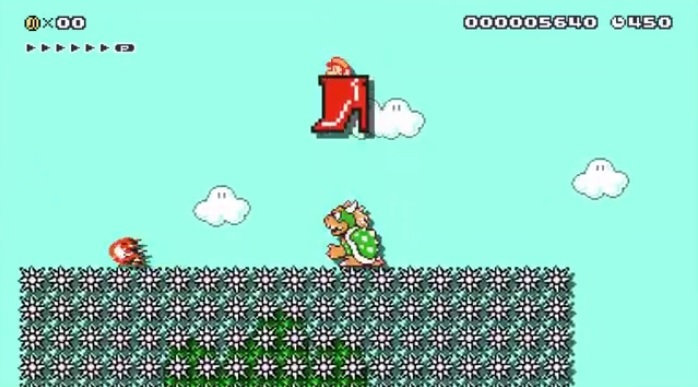 Back on the ground, the level’s third stage included a great little item in Kuribo’s Shoe, which let you stomp on enemies like Spinies and Piranha Plants. It was great to be able to “break the rules” and do something you never could… but instead of this being the first time you see it in the game, it’s the *only* time you see it in the game. In fact, it’s the only time you get to use it in ANY Mario game, ever! Not counting Super Mario Maker, of course. 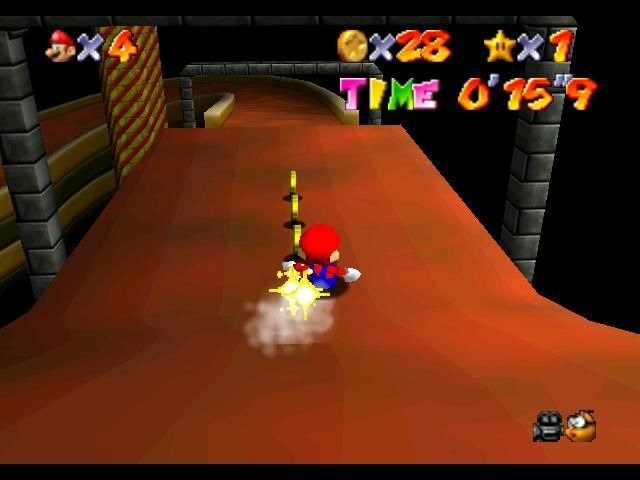 Whether I’d get to World 5 on a playthrough or used Warp Whistles to get there (as opposed to skipping right to the end of the game), 5-3 was one of the parts I always looked forward to. It lives on as being one of the most unique stages in the franchise’s history. The rest of the level’s stages were incredibly challenging with enemies you didn’t see in the other levels, and back in the day, that was the sort of thing that kept you coming back for more. Perfectly normal and not-at-all creepy-looking. The first time I rented a Nintendo 64 and had it all to myself, I couldn’t wait to explore every bit of Peach’s Castle. 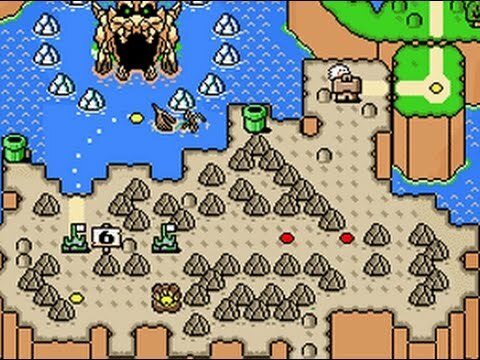 After getting a few of the castle’s stars and poking around outside to see what I could dig up, it was off to what I assumed was the final battle with Bowser. After beating him just a wee bit too easily, it dawned on me that this wasn’t the end of the game. It was already bigger, better-looking and played smoother than anything I had seen up until that point… and there was more of it??? Just how big was this game, anyway?? I headed downstairs with a key that apparently wouldn’t work in the first, really obvious door, but on the way down, saw a Boo in the hallway that wasn’t there before… huh… naturally, I followed him and wound up in the Castle’s Courtyard, which was now infested by Boos. Once I figured out I could actually kill them, it wasn’t long before I was whisked away to Big Boo’s Haunt, a stage with so many quirks I couldn’t help but be amazed at the whole thing. There was a merry-go-round with old-timey circus music, which was nice and creepy. Inside the mansion itself, you’re treated to chairs that that levitate, walls you can pass through, books that shoot out or try to eat you, and huge pits you can easily fall into. 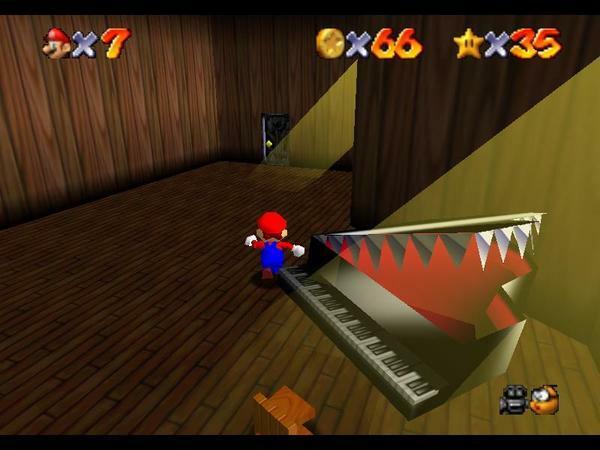 The first time I played this level and got to the piano room, it genuinely scared the bejeezus out of me when it started chomping at me. 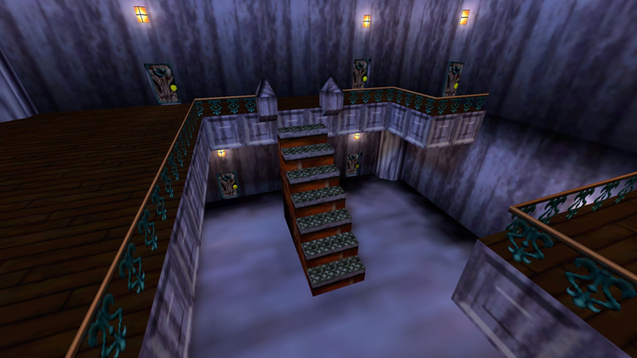 None of the Ghost Houses in prior Mario games were actually spook-worthy, so to have a level that played on your fears with atmosphere and audio was quite a treat. My love of this level is actually due to more than just how fun it was; it was already great just to run around and explore the scenery, but after Big Boo’s Haunt, doing all that actually served a purpose. Finding it proved you just never knew what you might find if you looked hard enough. In terms of “wow” moments from my early years of playing video games, it was the little things that were the most memorable. Or in this case, the MUCH BIGGER things. 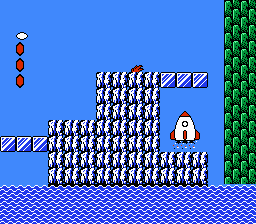 The payoff for beating the fairly challenging Water Land was Giant Land – a world where every common sprite was blown up to four times its normal size, and enemies like Goombas, Piranha Plants, Koopa Troopas and Hammer Brothers posed an even bigger threat than usual. Seeing these huge enemies and zoomed-in sprites for the first time was awesome. It might sound silly to have something so simple leave such an impression on us, but that’s just the way things were with games back then – I can’t explain it, you just had to have lived it. 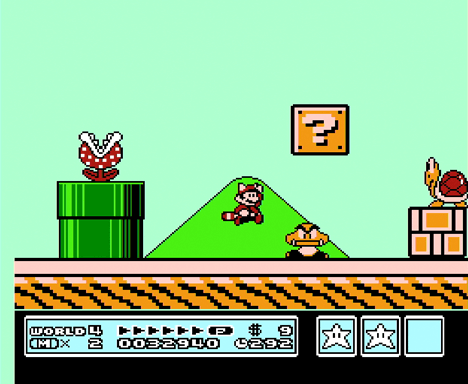 Super Mario Bros. 3 is one of the greatest games of all time, and getting to Giant Land sticks out in my mind as one of the coolest moments from gaming in my childhood. It’s nothing earth-shattering if you experience it for the first time *now*, but if you were like me, this level rocked your socks off.